Its berry picking time in Southside Virginia. Sure, the strawberries bushes have completed their task for the summer. But there are a lot more berries out there. How those blackberry bushes happened to grow in our pasture, we will never know. Wed lived here at the place we call Linger Longer for five or six years when Tim discovered the bushes. All those years, Id sent the boys out along the dirt road at the back of our property, scouring the area for blackberry bushes. Theyd come back, covered with ticks and eaten by mosquitoes, and Id spend half a day getting ticks off their bodies. Then one early July day, Tim came into the house and ordered me to close my eyes and open my mouth. Dangerous thing to do, when youre Tims mom! But something about his demeanor told me this was a good thing, so I did as he asked. 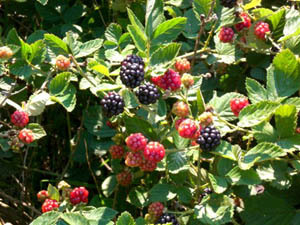 Ah, the sweetness of those blackberries fresh from the patch! Each year my kids know Im anticipating those first berries and keep me informed of the signs from those bushes. First, the blossoms, and then the white berries. Next, the red berries. In a week, we know theyll be ready to pick. The part we like best about these berries is that theyre in an open pasture and easily accessible for anyone of any size or height. Contrary to the memories Dave has as a child of coming back from picking blackberries, we experience no chiggers and few bug bites. One year Tim took a sheet of plywood and leaned it against the largest bush, then climbed on top and picked berries. The plywood made an indentation in the bush, and the next year there was a path right into its center, where the most succulent berries would normally have been hidden. So now Dave can be found trimming the bushes, making paths into their centers. Smaller bushes continue to sprout up around the pasture, and even a preschooler can pick here without having to reach high. I think the presence of cattle during the year helps fertilize the soil, making the berries large and sweet. Not all of my kids like to pick berries. They get tired of the briars and being pricked and scratched. Some mornings or evenings its humid and muggy. Were not all one big happy family when it comes to picking berries. But weve made memories--and enjoyed the fruit of our labor. Blackberry cobbler is a favorite in the summer--and also during winter months. Aaron, my youngest, has become an entrepreneur, selling berries beside the road, and having repeat customers from week to week and year to year. One day friends from out of state were visiting, and their little ones were becoming tired of waiting by the road and watching cars slow down and then roll by. Yes, I remember picking them. And we made blackberry jam. I just love that jam. Can I take some home with me again? she begged. So we picked the berries and made the jam. When it was time to go home, she packed her bags and forgot her toothbrush. But she didnt forget her jam. She carried it out to the car, holding it tenderly in her hands. She had helped pick blackberries and listened as I explained the process of jam making. A rolling boil, I told her as she stirred the blackberries in the kettle, is when it wont stop boiling even when you keep stirring and stirring. It just keeps rolling! Id forgotten that Id ever given her that definition, but she remembered. I continue to be amazed at the memories we make when were oblivious to their birthing. Long after Im gone, my kids will have stories to tell about Mama, her blackberries, and her blackberry cobbler. 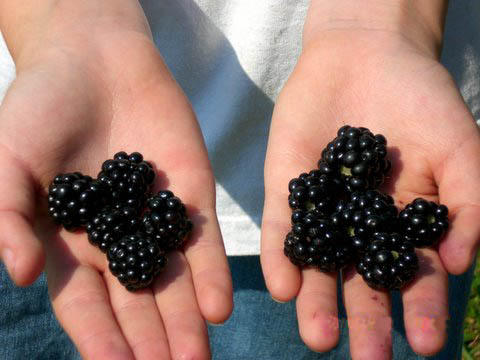 Im sure that, long after were gone, when its summertime and my kids see blackberries, theyll think of their dad up early in the morning, picking blackberries before he goes to work, then coming in and fussing at the kids he calls lazy. Theyll see blackberries growing in the wild, and theyll think of blackberry cobbler and me. Pour batter into an oiled pan. Put blackberries (or peaches or blueberries or a combination of any two) on top of batter. Top with 2 cups fresh, frozen or canned fruit. Bake at 350 for 40 minutes. (The fruit will go to the bottom and the crust comes to the top.) Serve with milk, whipped topping, or ice cream. Put your business in front of local customers. Your ad on Discover Southside reaches local customers all over Southern and Central Virginia.